Week 3 of Kayla Itsines Bikini Body Guide done! I’m especially proud of myself this week because I was very busy at the beginning of the week and travelling in the second half, so I was so grateful for a quick and easy workout that could be done anywhere. Last week, I bought a few pieces of equipment to make my home workouts easier, but apart from my skipping rope for the beginning of Week 4, I haven’t exactly been able to bring medicine balls or dumbbells in my carry-on! As I mentioned last week, my Week 2 kind of ran into Week 3 due to illness, so after completing Week 2 on Monday, I took a rest day on Tuesday, which was just as well as I had meetings all day until about 10pm. On Wednesday I headed to Psycle which made Thursday’s leg workout quite difficult if I’m honest, but I needed to get in a bit of cardio before I jetted off to Ireland for Easter weekend (more posts on that to come!). I proudly fit in my arms & abs workout on Saturday morning before breakfast and then ended the day with a 2hr hike, which meant that I decided to skip the Optional Full Body for another hike on Monday. But 3 LISS-ish cardio sessions done, plus 2 HIIT! 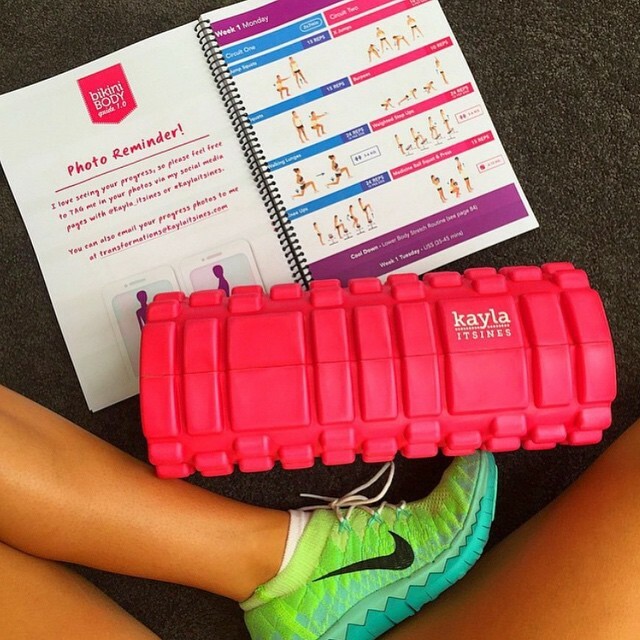 This really quite bland photo shows how easy it is to work out on the go with a Kayla guide. 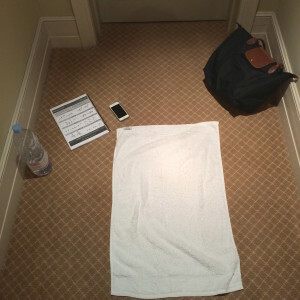 I used my hand luggage as a medicine ball (it probably weighed more than 7/8kg when I flew over to Ireland) and for tricep dips, I used the hotel room luggage rack (not pictured). Other than that, all I needed was a towel, the guide and my phone for timing. Easy! I have to say that by the end of the weekend, my body was exhausted, but I ate quite a lot over Easter, sampling (a couple of!) chocolates plus local delicacies, so I do feel the activity was necessary! On to Week 4! Have you read my Week 1 or Week 2 round ups yet?